At the "Boerderij", a venue perfectly fit for bands like Kayak, the band did another of their 'electric' Kayakoustic concerts. This particular one was a pretty good one, with all members in great form, and with a very receptive audience. As a happy Pim Koopman said after the gig: "this is exactly the reason that we still do live shows!!!". I also caught very satisfied reactions from Cindy, Ton and Edward. And it was certainly one of the best shows for the merchandise stand! * The Kayakoustic shows so far have had people in the audience from Holland, Germany, Norway, the UK, Spain, Venezuela and the USA. And probably from other countries??? * The concert in Hoogezand (23 november) was recorded for -hopefully- a CD release. 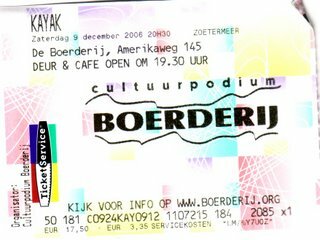 But there were some problems with the recordings... Kayak still hope that the recordings can be used, but they will also record the Ermelo show of 31 january 2007. * The Zoetermeer setlist (slightly different than the ones before): Intro See See The Sun, What's In A Name, Only You And I Know, Anne, Hold Me Forever, You're So Bizarre, First Signs Of Spring, Daughter Or Son, Epilogue-The Fate Of Man, See See The Sun, Wintertime, Royal Bed Bouncer, When Hearts Grow Cold, Merlin, The King's Enchanter, Branded, Lyrics, Act Of Despair, Starlight Dancer, Chance For A Lifetime, encore: Want You To be Mine/Ivory Dance, Ruthless Queen.